Fire Suppression: Call for any fire, large or small. Carbon Monoxide Monitoring: If your CO detector activates, leave the house and call 911. The fire department will respond and check the CO levels in your home. Wires Down: Call 911 if you see wires down, then stay inside or away from the wires. The fire department will secure the area and take the neccesary steps to make sure the area is safe until the utility company can make the repair. Odor Investigation: If you notice an unusual odor such as gas or smoke, call 911. The fire department will check for the source of the smell. If you think the smell is natural gas (rotten eggs), leave your house immediately, do not turn lights on or off and do not use the phone inside the residence. Call 911 from a neighbor's home and wait for the fire department to arrive. 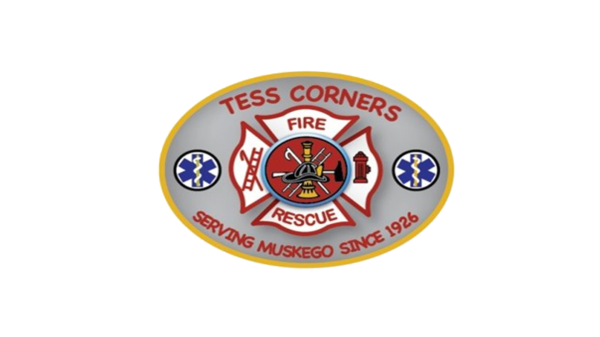 The Tess Corners Fire Department continues to improve training, skills and services so that the community may be better served and protected. All Tess Corners firefighters are required to become State Certified under the current guidelines. The Fire Department's training program is approved by the State of Wisconsin. The Fire Department is called upon to handle most emergencies that arise. The Fire Department responds to all fire related emergencies within the city limits of Muskego, and provides mutual aid to surrounding communities when requested. These may include structures, brush, grass and vehicle fires. The priorities of the department include stabilization, life safety and property conservation. Our members are continually trained in the best methods to apply these priorities to save lives and property. While most people are familiar with the fire department's emergency response services, fewer people are aware of the behind-the-scenes work that it takes to help prevent fires in the first place. The department has multiple state-certified fire inspectors, who undertake commercial fire inspections and fire code enforcement activities. Included in such activities are building plan review for new construction. The Tess Corners Fire Department has been providing Advanced Life Support Emergency Medical Service since 2002. Before this date we provided EMT-Intermediate Technician and Basic Life Support. Some of our firefighters are cross-trained as EMT's. We respond to approximately 1,550 calls each year. Our average response time to anywhere in the city is four minutes. Our Intermediate-level EMT's have specialized training in Advanced Cardiac Life Support, Pediatric Advanced Life Support and Pre-hospital Trauma Life support. Each one of our three fire stations respond to medical emergencies with a minimum of one EMT-Intermediate on the Ambulance, and our engines are also staffed with EMT's at various levels. This response allows us to meet the needs of our patients, no matter how critical the emergency is. Our firefighters have extrication tools and training that allows them to remove victims from entrapment in vehicular and commercial accidents. One of the most basic and essential services we provide to the community is safety education. The department offers station and on-site fire safety or first aid education programs in the school, to scouts and other interested community groups. If your group or organization is interested in having a speaker from the fire department make a presentation on any aspect of our operations or fire safety topics, simply contact us at 414-422-9733, or email officers@tcfiredept.org. Please try to provide at least four weeks notice.